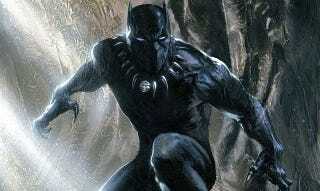 Did Stan Lee Confirm a Black Panther Movie? The answer depends on how much you think Stan Lee knows about Marvel's movie plans. But he said it was happening at Fan Expo Canada. We haven't made a Black Widow movie but she's been in some of our movies, and she will be featured more prominently as we move forward. And the chances are she will have her own movie because eventually all the superheroes are going to have their own movies. They are already working on Ant-Man, Dr. Strange and the Black Panther and there are others I am not allowed to talk about. Now, it's slightly strange to list Black Panther in the same breath as Dr. Strange and Ant-Man. Those other two have been officially announced and we've been hearing about their production for a while now. So having it as a film Lee can talk about is strange. But we've been hearing rumblings of Black Panther for a while, and Avengers: Age of Ultron has been repeatedly linked to T'Challa's nation of Wakanda. So it may very well be the next movie we hear announced.